I have been thinking a lot about ritual over the last year especially. As a Bard in training with the OBOD a more systematic approach to ritual has been a big part of my life, not every day by any means but on a much more regular basis than it would have been in the past. If we think of ritual as something that we do regularly though, it is possible to see many aspects of our lives that we may not have considered to be ritual as such. If we sit down every morning at 11am with a cup of coffee that is ritual as is always making a pot of tea in the same way e.g. Warming the pot, letting the tea stand for 5 minutes, always putting the milk into the cup first etc etc. Since I have cut down to one cup of coffee a day taking time for myself to sit and enjoy that single cup has become a delightful ritual. The more compulsive we are the more rituals we may find we have in our lives. We may for example may have rituals about washing our hands, turning off the lights, locking up the house when we leave, dressing ourselves, preparing or eating meals, the list is endless. Then of course there are the rituals to be found in our culture or religion such as baptism or christening, 18th or 21st birthday parties, engagements and marriage, hand fasting, initiation rites and seasonal or family celebrations. Where we are from, the culture we grow up in or develop for ourselves is a strong influence on the type of rituals we perform. Those of us who are on any kind of spiritual path may have other forms of ritual. Maybe we always clean our crystals at full moon, light a candle when we want to sit quietly, chant, meditate or do Tai Chi every day, or maybe our rituals are more complex. Some of the ritual that I have been working with over the last year has been connected with the turning of the wheel and the passing of the seasons, and have taken place at the time of the eight Celtic festivals. This has been the first year I have celebrated all eight festivals and it has given me a much greater connection with and awareness of the seasons and the changes that occur during these times. Because I can see the real benefit for me of ritual at these times it is something I know I will continue. There have also been other rituals, at times these have been about creating safe and sacred space in which to work, at others the rituals have helped me to connect more deeply with the elements for example. What has been important for me though has been making these rituals my own, listening to my own guidance and intuition about what feels right for me at this time and what feels that it needs to be left aside. This I can do as a solitary practitioner, were I performing some of these particular rituals within a group then there would be less freedom to make them my own due to the need for everyone to have a role and actively participate. One important role of Ritual is to provide us with the structure and familiarity to feel safe and know where we are. In my work as a shamanic and energy healer I also have rituals. When I prepare my room each day and myself for the work I am to do there is ritual. For me this ritual helps me to shift into work mode, to create the right environment for me to work in and for my clients to be in and it also gives me space and time to ground myself, protect my energy and connect with my spirit allies and guides. Ritual in this way helps me to remember what it is that I need to do. When I perform ceremonies either public or private these also involve ritual and again here although there may be elements that are always or usually present, the ritual will vary according to the purpose, the place I am working in, the people present, the time of the year, and what my own guidance is telling me is needed. As I drew the connection for this week, even though I had drawn it for everyone reading my blog, it really resonated with me. For the last month or so I have been working as part of my Bardic training, with the element Fire and two things that have come up frequently through the work are Responsibility which was the last connection drawn and today’s connection, Passion. This certainly reinforces the concept that everything that exists is interconnected and communicates. ‘Do not dwell on what you cannot have or what you have not yet obtained but rather find the passion that is in your life, the things(s) you do that make life worth living and then chase after these with all your heart. These are the only things that matter, nothing else is of any importance to you no matter what anyone else believes’. I’m sitting here on a Monday morning, the sun is doing its best to break through but is struggling. Yesterday it rained all day, not the odd light passing shower we have become used to this summer but real, solid rain. I was actually teaching Reiki to a new group of students all weekend and in some ways, being tucked up safely inside the log cabin while we learnt and worked together with the rain dropping and dripping onto us from the ash trees above, was the nicest possible place to be. It also meant that the earth here and of course the plants and trees got some of the moisture they so badly needed. I am hoping too that some of it went to increase the water level in our well so that there is some there for us to use. Having our own well has made me much more careful with water than I was when we lived somewhere with mains water. I turn off the taps quickly, never leave a tap running when I wash or to clean my teeth. I use the economy, low water setting on the dish washer and washing machine and wash my car once in a blue moon. Ok the last one is because I am lazy and besides as soon as it’s washed it gets dusty or muddy again but it still counts. In the summer I am always extra careful and cautious as there is no way of telling how much water there is there. I find myself watching the water levels in the local rivers but have no idea how much of a guide this is. What is does do though is connect me more deeply to the natural world and in particular the element of water. Having a well increases my awareness and gratitude for an aspect of nature that we seem to feel we have a right to take and use as we see fit. The gratitude of there being water when I turn on the tap also manifests in my appreciation of the quality of the water I have access to. Even on the hottest day the water is still ice cold. It is always clear and clean and tastes like water should. It does not contain fluoride or anything else that man has deemed it right to add to drinking water. This means that I am more likely to choose to drink our water over and above anything that would be less healthy for me. So although it looks as if summer has come to a premature end, there is part of me that welcomes the change in weather and the rain it has brought with it. I really am not sure what the weather will actually do today but if it rains then I for one will happy. I may even go and stand outside and give thanks for it. Quan Yin, Kwan Yin, Guanyin, Kuanyin, Mio Shan, is a goddess, a goddess who’s energy really resonates with my being especially at times of great need for she is known as the Goddess of Mercy and Compassion and exists in one form or another in all cultures. As with all deities, there are many stories that surround her. The purpose of this blog though is not to delve into these for they can be found easily on the Internet, but to give a flavour of what to me is a very special Goddess. Quan Yin is spoken of as being Buddhist, a Bodhisattva, an enlightened being or ascended master. She is also said to be The Lord of Karma as well as being the Divine Mother or Mother Mary. She is even spoken of as being the Tibetan Tara, who it is also thought is connected to the Hill of Tara in Ireland. The Celts would have know her as Goddess Tara, her name being the root of the word Tor meaning hill or mound of earth containing spiritual energy or in other words a connection to other worlds. Her name though is also said to mean Star. The first reference to Goddess Tara is thought to have been in Finland 5,000 years ago in an ancient saga about a group of women known as Tar, the women of wisdom. Even as Tara she has many incarnations for example Green Tara, White Tara, Red Tara, Tarahumara in South America, and Goddess Ishtar in Ancient Egypt. I first became aware of Quan Yin when travelling in Vietnam. Here it is difficult to pass a marble workshop without seeing the imposing statues that represent the goddess. Goodness flows from her every image and that she is loved by everyone became clear during my time in Vietnam. I later reconnected with her as Lady Tara when a friend who was training in Transference Healing brought her back to my attention for in Transference Healing Tara is one of the ascended masters who is worked with. Since then I have worked with Tara as one of my guides. She is not always present, far from it, but works with me when she believes I need her. I have worked with her at whilst on both Sun and Moon Islands in Lake Titicacca and from her have received great healing and profound teachings. More recently though I found her with me once again whilst I was awaiting test results from a scan. She came to me and reminded me to reconnect with her as Tara and the energy of Quan Yin. This I did and it brought me real peace and calmness, taking away all the fears I had been generating and instead leaving me feeling safe and cared for. Whichever form she takes, whichever incarnation is connected with her energy remains the same. Gentle yet strong, peaceful and calm, free from judgement or prejudice, there to bring mercy to all in need. A powerful and compassionate Goddess indeed. This wouldn’t be one of my favourite connections or teachers but often those ar the ones we learn the most from. This is not the first time Responsibility has come up for me recently as it’s also something I’ve been working with in my Bardic training. Listen to your heart, responsibility isn’t something which holds you down but rather something that can set you free. When your sense of responsibility is turned inwards then you will always know what to do at any point in time. One of the things I love to do when I have a moment spare is to put my hand in the bag, pull out a connection and see what message it has for me for that day. These connections are not necessarily the ones in my own web of life but some of the myriad of connections that there are within the great web that connects us with every thing that exists. Today the connection I drew was Stars….. 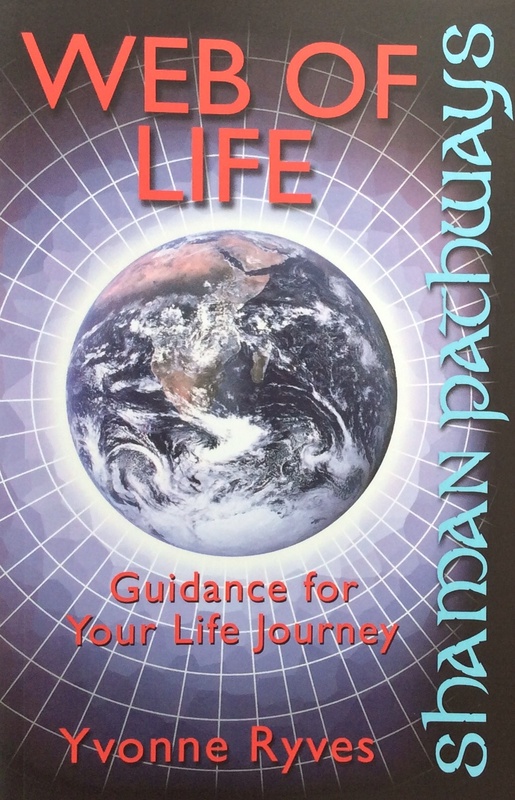 If you would like to learn how to work with and develop connections in your own web of life ‘Web of Life: guidance for your life journey’ published by Moon Books as part of their Shaman Pathways series can help you do just that. Someone I was working with the other week said they thought I should do puzzles to help my brain as I got older. This is a good point as we do need to keep our minds active and our brains stretched in the hope that we may be able to avoid dementia in any of its nefarious forms. The problem for me though is that I have never done puzzles, or rather I have tried and failed miserably. My mind has never seemed to work in the way that it would need to to be able to do crosswords, suduko or any of the types of puzzle that are supposed to be useful. I also don’t like board games or scrabble, nor do I play chess or bridge. I don’t actually think that forcing myself to do something that I really don’t like doing would be the best way to stretch my brain, besides some days my brain feels stretched enough as it is. I also know that my brain works in other ways so for me the best way I know of to stretch my brain is to make sure I learn something new, every day if I can. I do this by actively studying and learning. At the moment it is the Bardic training with the OBOD, something that is stretching me in many ways. Alongside this I am doing a colour pencil certificate course with the London Art College plus of course continuing to paint in watercolours and read, both for studying and for pleasure. I also have to plan my work, my diary for clients, and for teaching, make decisions, manage my finances, write my blog and so on and so forth. Between all of these I am using both my left and right brain. This all got me thinking that advice on how to stretch your brain is a bit like advice on diet, or the best way to heal, to be spiritual, pagan, shaman, or do anything really. For me, with this as with everything else, it is about making an informed choice, knowing myself, what works for me and not minding what everyone else is doing at all.